1) The nose is aggressive and beautiful. 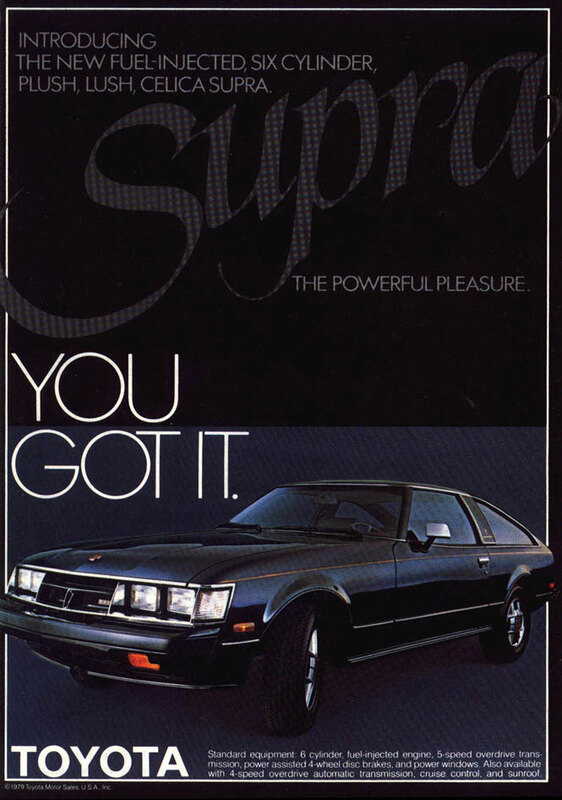 The grille-less treatment reminds me of two cars: The facelift (’89-’92) “Klingon nose” Mark 3 Supra, and, weirdly, the first-generation Lexus SC—one of the loveliest cars to come out of Japan. 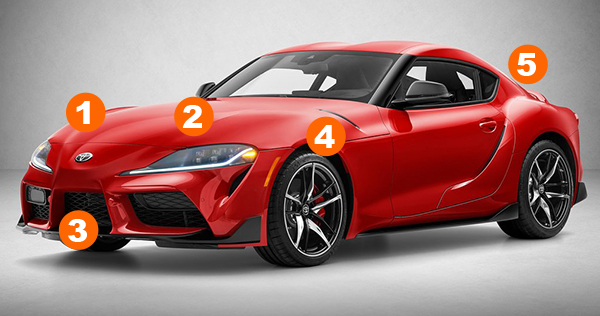 2) The headlights are distinctively-shaped (more on that later) and have the potential to become a Supra trademark should the lineage continue. 3) The large center grille opening is just begging for an intercooler to show behind the black mesh. 4) These cuts atop the fenders are a little fussy, but they take some visual weight out of the area and carry hints of the Ferrari F12’s “aero bridge” in the same region. 5) Overall the car looks much smaller than it is. Credit the relatively high fender line and tucked-in fastback shape for that. 6) The car’s signature styling element is the way the fastback is pulled in to expose the rear wheel arches. Brilliantly, the S-line from the base of the front wheels, through the cut on the door and up over the rear fenders is echoed in the shape of the DRLs and tops of the headlights. It’s a perfect way to make the car’s design more cohesive. 7) The greenhouse, with its double-bubble roof, blacked-out A-pillars and quarterlights that taper to a point, is pure Toyota 2000GT. 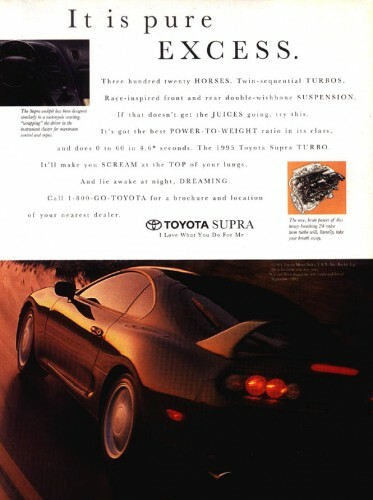 8) I’m surprised but glad Toyota decided against bringing back the Mark 4 Supra’s four “pool ball” taillight treatment. It wouldn’t jive with the A90’s themes and I’m happy they moved on with a more understated look. 9) The ducktail hints at the shape of the Mark 4’s hoop spoiler without being nearly so tacky. I’m sure special editions of the A90 and tuners will stack an additional spoiler on top. 10) Bonus points for wheels that aren’t totally black, even if the alternating black-silver spoke pattern is a little strange. 12) In contrast to the exterior, the interior appears a rather dour and conservative place, like Toyota ran out of styling capital with the car’s inside incomplete, so they just tweaked and dressed up the Z4’s cabin (which is probably close to the truth). That said, the Mark 4’s interior always struck me as plasticky and haphazard, so at least the A90 improves on its predecessor a little. 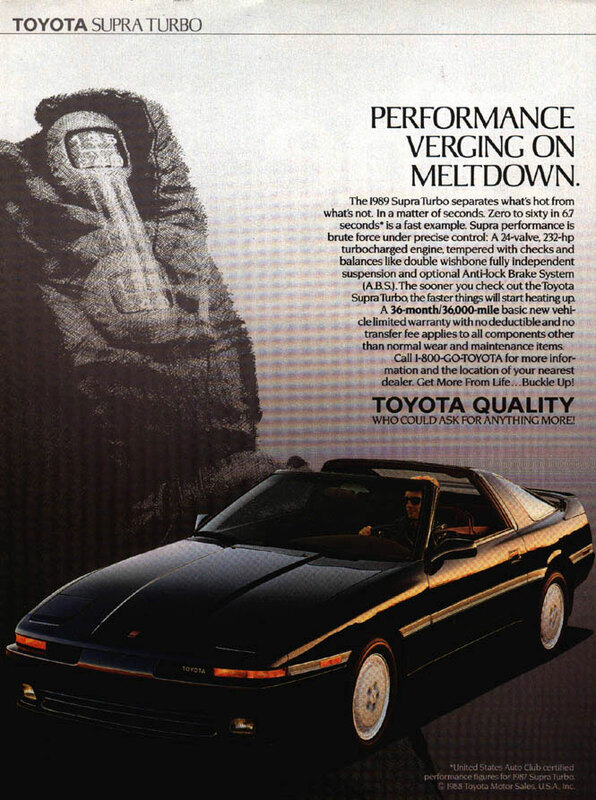 13) The Toyota emblem looks lost in the middle of a giant round airbag cover, like a “shoebox airbag” from the ’90s. 14) This element is on the wrong side of the console; it actually separates the driver from the console’s controls in favor of the passenger. Very odd. 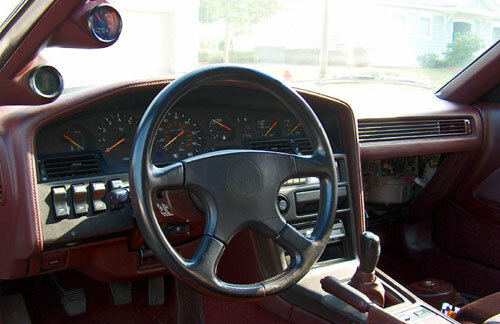 Both the A70 and A80 Supra’s consoles swoop around the driver and create a “cockpit” environment—the opposite of what’s going on with the A90. One thing’s for sure: If Toyota ever decides to fit the new car with a manual (here’s hoping), that little buttress is going to get in the way when shifting. A statement of intent perhaps? 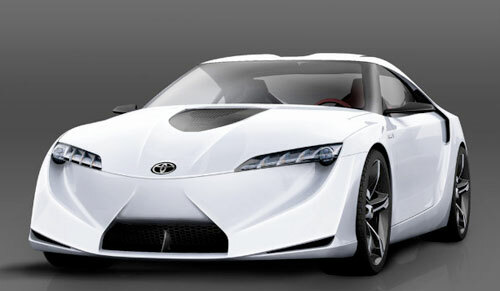 Overall, I love the A90’s design; it’s forward-looking while drawing on Toyota’s styling heritage. I still think the exterior styling is more resolved than the interior, but in any case, I can’t wait to see them out on the road. 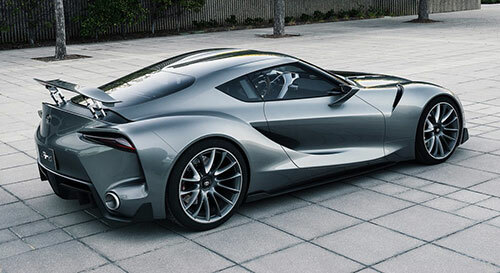 Much like the 1993-1998 Supra was criticized for being a mashup of details lifted from various sports cars, Toyota’s FT-1 Graphite concept, allegedly the inspiration for the upcoming resurrection of a Toyota sports GT, reveals various styling influences. I think it’s a great looking concept. I appreciate the fact that the nose is “enclosed” and doesn’t feature a gaping maw like the latest designs from Toyota’s upscale brand, Lexus. However, the nose does recall those on two of the most aesthetically-successful Lexus designs: The first-generation SC coupe and the latter-day LFA. As styling inspirations go, Toyota could certainly do worse. The deeply-drawn nose intakes give the nose and fenders an almost separate, “podded” look. Toyota pulled the plug on its factory Formula 1 team five years ago, but the visual similarities between the FT-1 Graphite’s front clip and the nose and front wing area of an F1 car are hard to deny. I see some of Panoz’s paradigm-bucking, front-engined GTR-1 endurance racer in there as well. The new concept’s most obvious connection with the late, great Supra is in profile, where it adheres to the classic hunkered-down road-eater aesthetic featured by its predecessor and common to all great GTs. It’s a traditional long-nose, short-tail look that even the complex body sculpting doesn’t overpower. The quarterlights are a bit of a head-scratcher, though, since they sport a very Nissan Z-Car-like turn-up kink as they taper toward the rear. From a visual standpoint, it works, but it will probably be difficult for Z-Car buffs to ignore that detail. 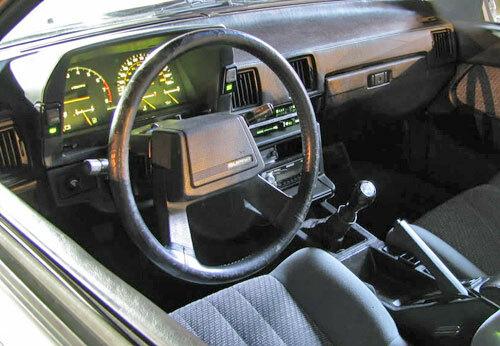 The interior is more traditional, if unadventurous, concept car territory, which is to say it looks like Ikea designed a fighter jet cockpit. 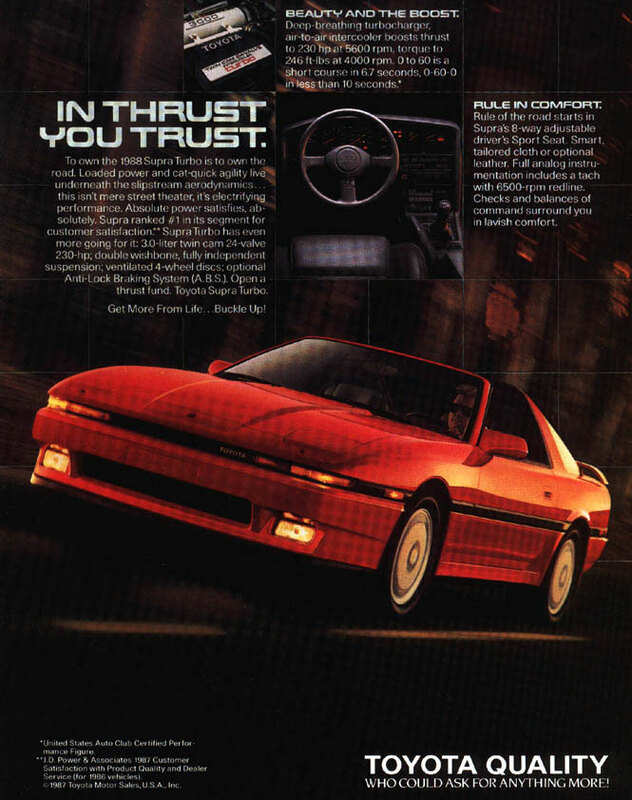 At least it has a slight nod to the Supra’s interior styling with the quasi-wraparound element to the right of the steering wheel. Naturally, there’s no hint of a third pedal because, well, that’s the way the performance car world turns these days. From an aesthetic standpoint, the FT-1 Graphite is a winner. 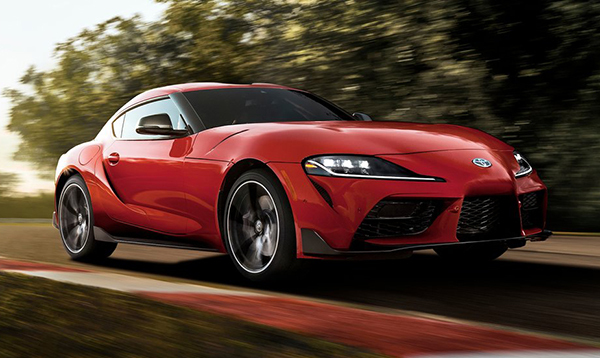 A few things remain to be seen, among them how much of its styling Toyota intends to translate to a production car and the all-important question of what exactly will motivate the resultant Supra sequel. My money’s on either the Lexus RC-F’s V8 or, more likely, a cutting-edge hybrid setup that would allow the automaker to leverage the expertise it’s gleaned building hundreds of thousands of Priuses in a more performance-oriented direction. 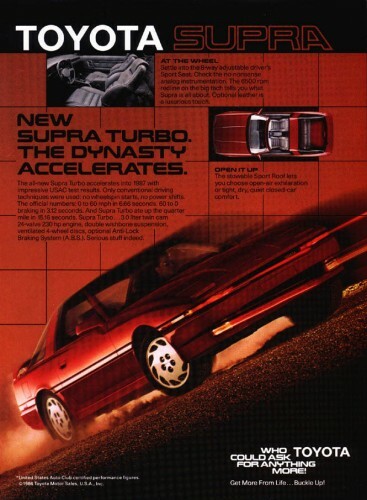 Naturally, I would love to see a revival of the turbocharged inline-6, a configuration the Supra utilized to spectacular effect but effectively extinct from the modern car marketplace except for BMW’s efforts. We’ll see. 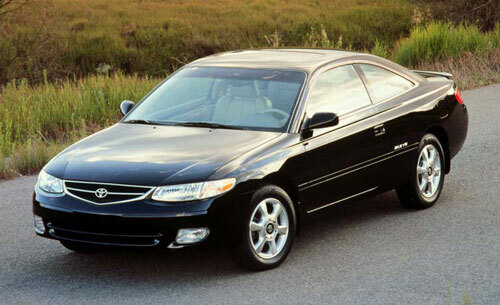 Much better looking than its Rubbermaid-like sedan version, the first-generation Toyota Camry Solara is blessed with a remarkably cohesive, pleasing shape, neither too restrained nor too overdone like its successor. 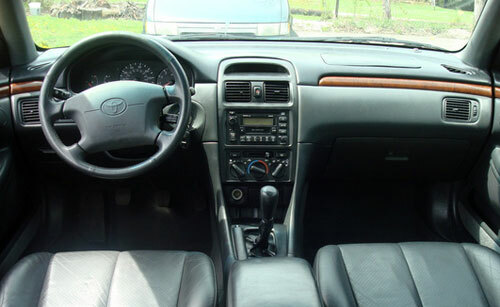 Toyota finally decided to spin off the coupe version of their best-selling Camry in 1999, giving it a distinctive name and distancing it styling-wise—without completely severing all visual connections—from the Camry sedan. 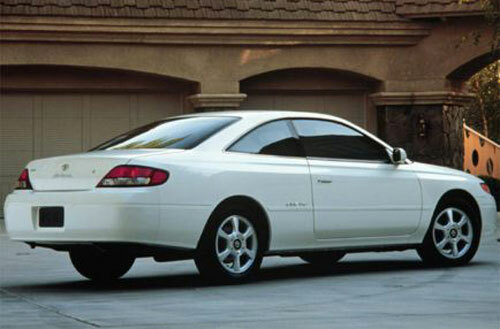 While most consider the Solara’s design just as bland as that of its four-door sibling, I think the (slight) bit of added design dash serves the shape very well, elevating it from “completely anonymous” to the realm of “tasteful and tailored.” The strong character line emphasizing the car’s beltline and tying its two ends together relieves what would otherwise be a very slab-sided, bathtub-like shape and gives the Solara just the right amount of visual detail. 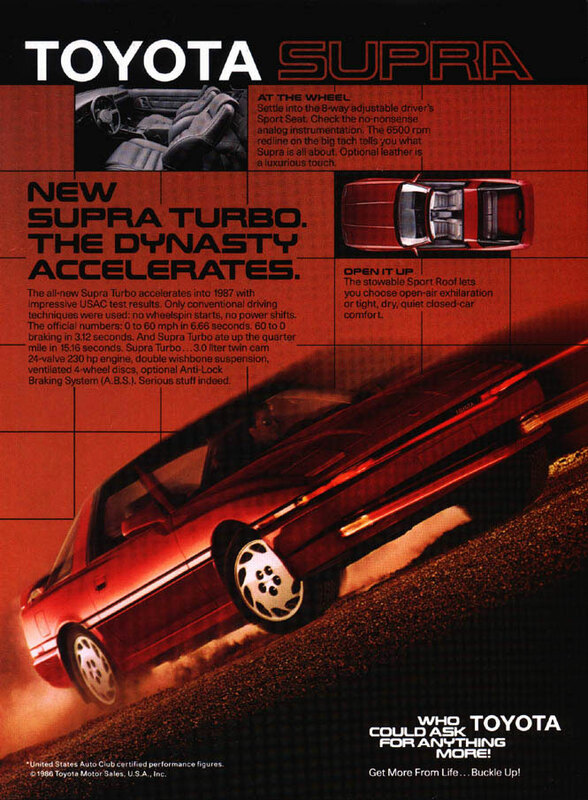 The first-gen Solara had the added bonus of being available with a 5-speed manual transmission, generating a bit more interest as far as enthusiasts are concerned, though it will be said that particular option seems to be as scarce as hen’s teeth, the vast majority of buyers having decided to forgo the pleasure of rowing their own gears. It’s a delightful shape. Find me a stickshift and I’ll happily assign it to commuter duty. Dug these up recently from an old hard drive. I don’t know about you, but whenever I’m interested in a car (I don’t even have to actually own it), I’ll create a new folder on my computer simply as a repository of noteworthy pictures and documents. This post illuminates the contents of one such folder. 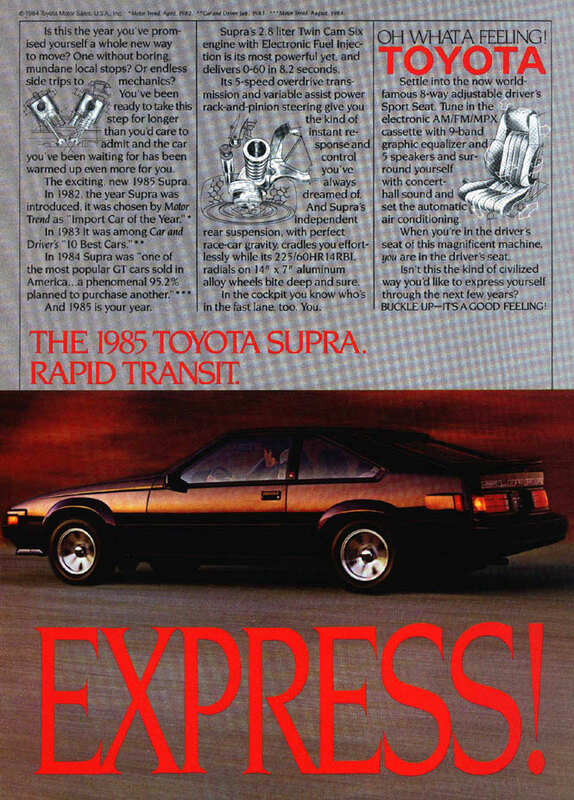 It’s neat to see Toyota’s advertising change over the years, and to a slightly lesser degree, the emphasis of the ads. Enjoy. 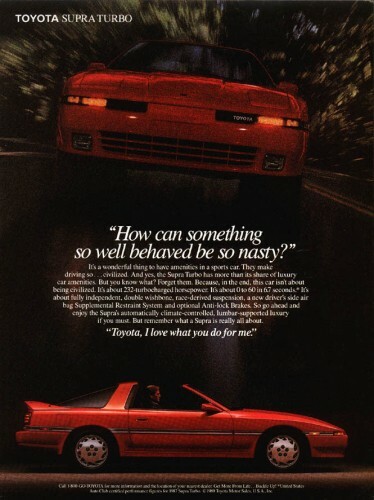 Have I mentioned lately how much I miss my old ’88 Turbo? 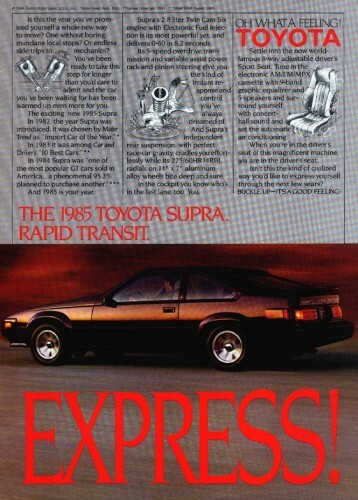 I love boxy cars from the ’80s, but I just can’t warm up to the 1982-1986 (Mark 2) Supra. On paper, it checks all my boxes (pun intended): RWD, 5-speed, cruiserweight of 3,000 lbs, rack-and-pinion steering, all-independent suspension, straight-6 engine up front and imbued with just the right mix of sportiness and luxury. It’s a classic GT, the car type I’m most drawn to. The big reason we love this car is that it does everything elegantly and never seems to breathe hard. Around the burbs and out on the freeway it coddles you with a ride that’s cushy but never wobbly. Its straight-line stability is laser-keen. Lane changes are sharp. The twin-cam six is pure velvet. There is some wind, road, and rear-axle noise, but it’s less than disturbing. 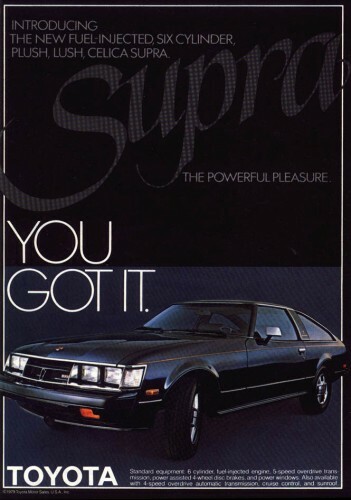 When you want to boogie, the Supra is right there to be your partner. The engine howls as if it believed it’s in a BMW. Come to think of it, the whole driving experience is what you’d expect from a big Bimmer coupe. 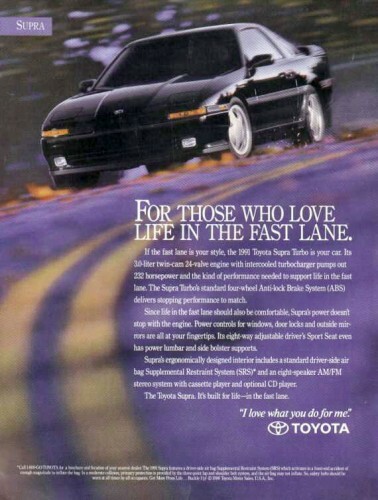 The difference is that we mere mor­tals can afford the Supra. This car’s footwork is nearly flawless. It’s absolutely at home clawing along the jag­ged coastal highways at go-to-jail veloci­ties. Its steering accuracy and feel rival the big-name brands’. 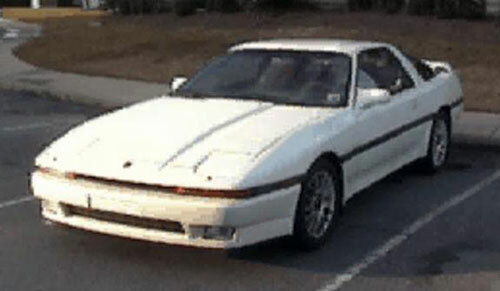 And when you make a mistake, the Supra covers for you. Add to that glowing review the fact the Mark 2 Supra is about 500 lbs lighter than its successor, the ‘86.5-’92 Mark 3 Supra, and nearly as upgradeable—either the Mark 3’s single-turbo 7M-GTE or twin-turbo 1JZ-GTE engine will nestle perfectly into the Mark 2’s bay—and a dismissal of it as a platform becomes even more difficult. 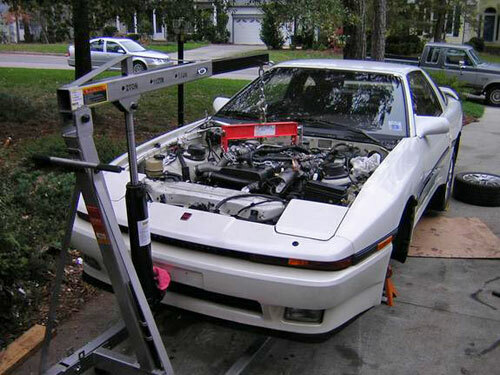 A 3,000 lb car with a converted single-turbo 1JZ pushing 500+ reliable hp is a recipe for serious speed, and the kind of formula that makes my pulse quicken. So what’s up? Why am I not on this car like white on rice? The looks. 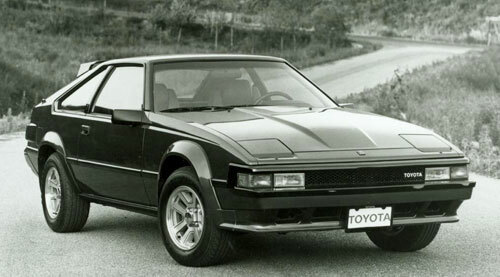 As much a fan as I am of angular, wedge-y ’80s styling, the Mark 2 Supra just crosses the line, in particular with its Borg-like nose treatment that looks for all the world like a docking proboscis for some kind of interstellar battleship. In light of its sub-sheetmetal qualities, I’ve tried mightily to like its design, stared at images of it for some time trying to get used to the styling details, but…if I’m honest with myself, I simply can’t do it. In fairness, there are certain color combinations in which the fascia rises to the level of acceptability, if not outright attractiveness—usually when color-keyed to the body—but the design still never rises to the point where I’d seriously consider it as a potential purchase. The angularity is simply too much. I have no doubt that Scion will eventually go the way of Plymouth. Robinson touches on marketing and project development missteps by the brand, including redesigning their distinctive and successful first-generation xB econobox and tC sports coupe into anonymous, blobby shadows of their former selves. Although I agree with Robinson’s assessment on that point, I don’t think it’s entirely fair to lump in the brand with other defunct nameplates like Mercury, Saturn or even Oldsmobile and Pontiac. 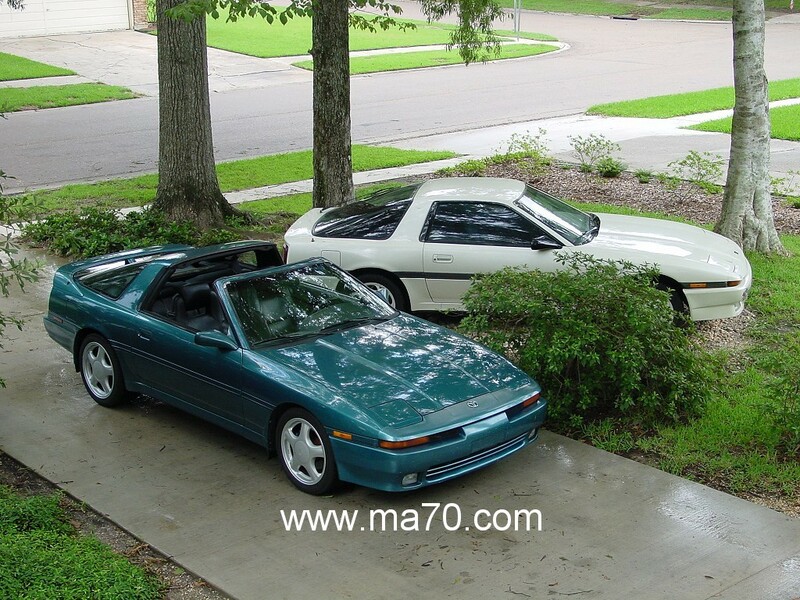 A primary reason for the demise of the marques listed was an utter lack of a market in comparison with their badge-engineered stablemates from the same overarching automaker (Ford, General Motors). Scion doesn’t have any internal competition at Toyota, and its mission to offer cars in the low-cost-yet-fun category is much better defined than that of Mercury or Oldsmobile, for example. There’s still a reason to keep Scion around, even if its parent company flounders somewhat in marketing its cars. Opportunity is still present, even if untapped. Furthermore, from the perspective of an enthusiast, a multiplicity of nameplates is a welcome thing. In a day and age when brands are being euthanized right and left—Saab being the latest to kick the bucket—we should welcome diversity in contrast to an overweening corporate homogenization. Does any true car buff look forward to the prospect of a growing number of increasingly bland cars cranked out by just two or three automakers? No—more brands means more minds solving the same problems, more innovation, and more interest. 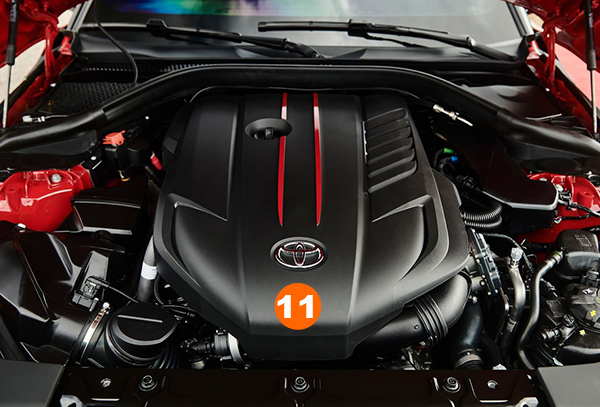 That isn’t to say we should keep a brand on life support just to keep a nameplate alive in the absence of a worthy product, but in the case of Scion, compelling reasons do exist to maintain the marque, and other issues such as racing pedigree and history, although they take time, can be developed. With respect to what it set out to do—secure a 24 Hours of Le Mans victory for manufacturer Toyota—the GT-One was a miserable failure. Aesthetically, however, it’s a fascinating car, especially from a Japanese outfit. 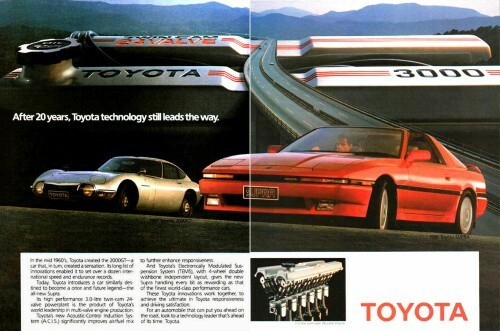 Purpose-built to conquer Le Mans, the GT-One nestled into the then-top-tier GT1 class in ’98, and the GTP class in ’99, the shift necessitated by a regulation change that required more roadgoing examples built in order to homologate a car for the highest-level class, an effort Toyota was unwilling to put forth. 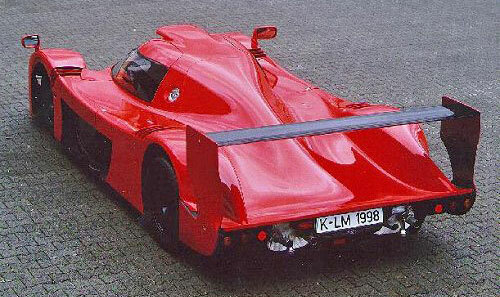 Although its twin-turbo 3.6l V8 and Dallara-developed chassis gave the GT-One a competitive turn of speed, it was let down by mechanical failures, tire disintegrations and just plain bad luck (read: collisions initiated by other racers). Even with the enormous resources of the Japanese giant, the car could finish no better than 25 laps back of the winning Porsche 911 GT1 in ’98. It did manage to hold on to second place overall in ’99, but that achievement was tempered by the fact that it was running in a class by itself, the other race cars having to abide by slightly more stringent rules. In spite of its lack of success around the Circuit de la Sarthe, I’m fascinated by, if not necessarily drawn to, its looks. Perhaps the most arresting aspect of its lines are their utter organic-ness. To generalize, even when incorporating sweeping, curved shapes, Japanese-sourced styling isn’t known for being the most romantic, as it were. 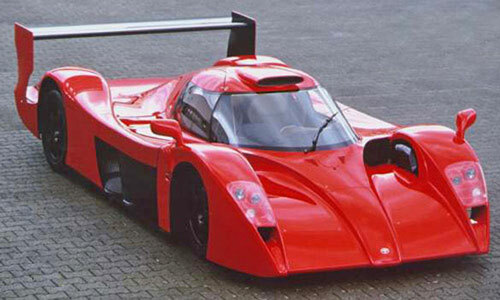 But on a race car, no less, where form should be fully subservient to function, the GT-One’s shape looks downright fanciful. 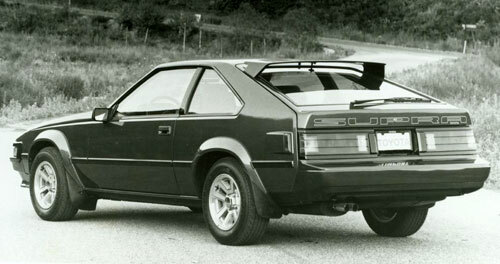 Examine the gothic curve of the nose cone, check out the insectoid headlight clusters and the rippling expanse of bodywork aft of the cockpit, terminating in a full-width ducktail and baroque spoiler. Looking so much like an idle concept exercise, I couldn’t believe Toyota had actually raced one “in anger” when I first beheld it (admittedly, in the video game Gran Turismo 2). They deserve recognition for creating a car so distinctive, if not successful. Of all Japanese automakers, Nissan and Lexus, with their GT-R and LFA, respectively, get it. No electric motors, please. No fuel cells, giant capacitors or kinetic energy recovery systems. Just plain old gasoline-generated horsepower, and lots of it, for our sports cars. And yet, Honda and Lexus’ parent company Toyota, seem to want to mimic their eco-crazy European counterparts in developing hybrid sports cars. As if that weren’t bad enough, it seems likely both companies will revive storied model names to give their new creations a measure of “legitimacy” out of the starting blocks. 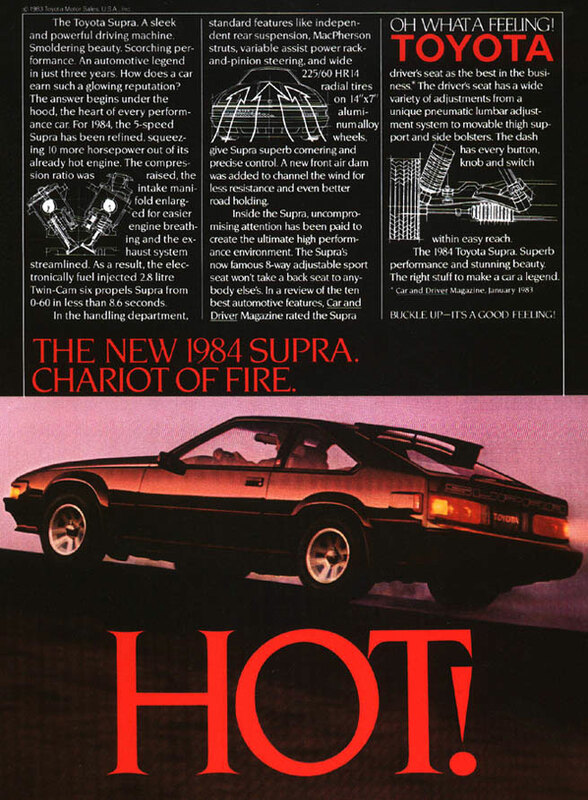 In Toyota’s case, the rumors aren’t anything new—the automaker has been coy about the development of a “Mark 5” Supra for ages now—but the recent introduction of the clean-sheet, RWD GT 86/Scion FR-S has freshly stoked the fires of speculation. And with the FT-HS concept car, shown at top, all that’s left to wonder is what Toyota’s waiting for to pull the trigger. It’s understandable the collapse of the Japanese sports car market during the late ’90 would leave that country’s automakers wary of introducing any new top-of-the-line road eaters, and Toyota is a cautious company in general. That said, the automaker is the poster child for hybrid success with the runaway popularity (relatively speaking) of their Prius, so it wouldn’t be too far of a stretch for them to adapt some well-proven hybrid technology to a range-topping sports car. And Toyota’s never made a dynamically bad car, so its driving characteristics will undoubtedly be above reproach. 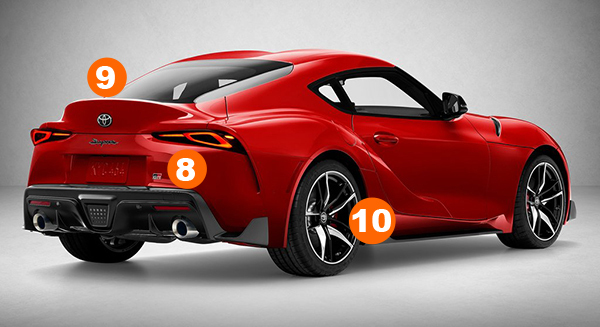 The only question left, then, is what enthusiasts would make of a new Hybrid Supra. Would they enthusiastically embrace it? 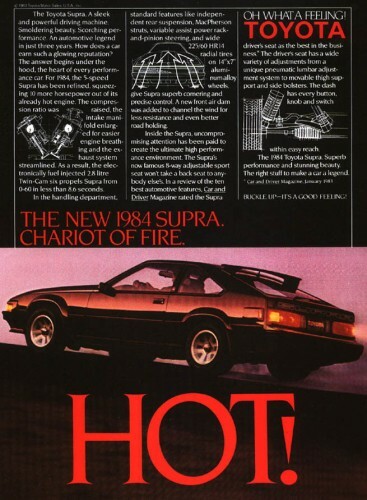 Or recoil in horror that the legacy of the canonized Mark 4 Supra would be tarnished by association with technology primarily geared toward economy? 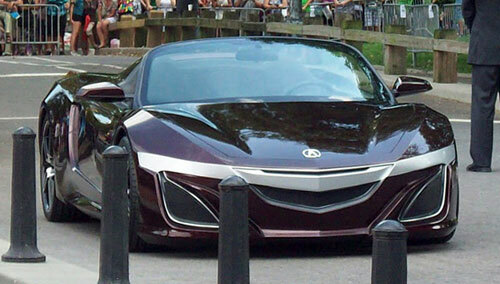 Sources inside a Las Vegas dealer meeting earlier this month exclusively told us the new Acura NSX Concept would look like the vehicle from the upcoming Avengers movie (albeit in hardtop form) and feature an AWD hybrid drivetrain. If true, this would mean a radical departure from the car’s previous life as a pure, light-weight, RWD sports car. I share the site’s sense of disappointment at Honda’s divergence from the formula that made the original so distinctive. In a way, if the automaker does decide to attach the NSX nameplate to the trunklid, they stand to lose more than Toyota would in naming an upcoming hybrid sports car Supra. Although comparable performance-wise, the NSX was an altogether more pure sports car than the Supra, offered at a higher price point, and basically unchanged (or unsullied, depending on your point of view) from its introduction through the end of its model run. The game-changing nature of the original NSX‘s arrival means a new AWD, hybrid version of the car would more radically redefine the car’s image and purpose compared to a similar situation with the Supra. 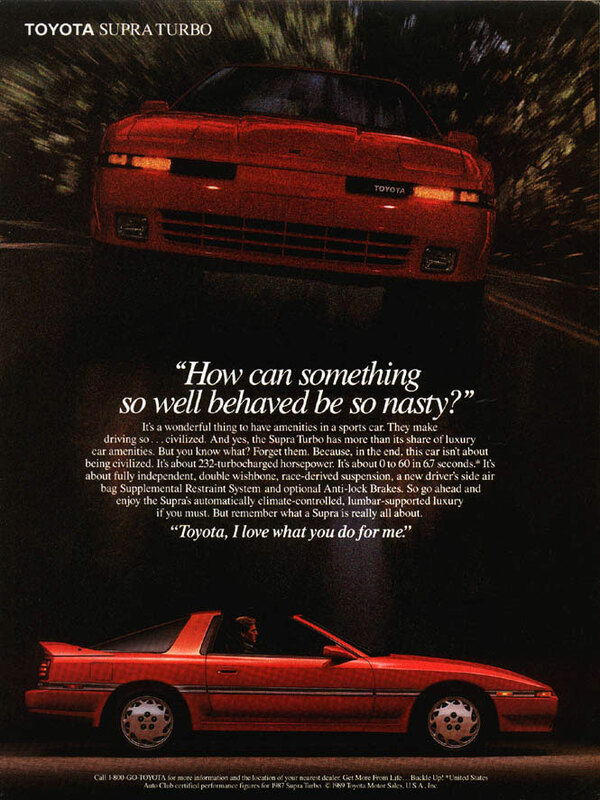 For the record, I hope both Honda and Toyota come around and offer genuine GT500/Corvette/M3/911 competitors, but given industry trends toward more complex, “eco-friendly” vehicles, I’m doubtful a refreshingly conventional successor to the NSX or Supra will see the light of day.